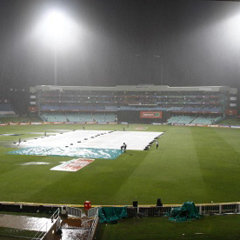 Cape Town - Heavy rain forced a second successive home washout for the Dolphins as their T20 Challenge match against the Warriors was abandoned without a ball being bowled at Kingsmead in Durban on Wednesday. The hosts, whose clash against the Knights last Friday was also called off because of the weather, had to instead settle for a share of the four points with the visitors. Rain had been predicted for the game and a largely overcast day on the east coast ended with the heavy showers arriving during mid-afternoon. With the outfield heavily soaked, the umpires decided to call off proceedings within an hour of the scheduled 6pm start. The Dolphins remained third on the table, now on eight points from four games, while the Warriors moved up one spot to fifth with two points from three matches. The Titans, who the Durbanites play on Friday, are the runaway leaders and lead the standings with 19 points from four matches. The Warriors play the Knights on Friday.